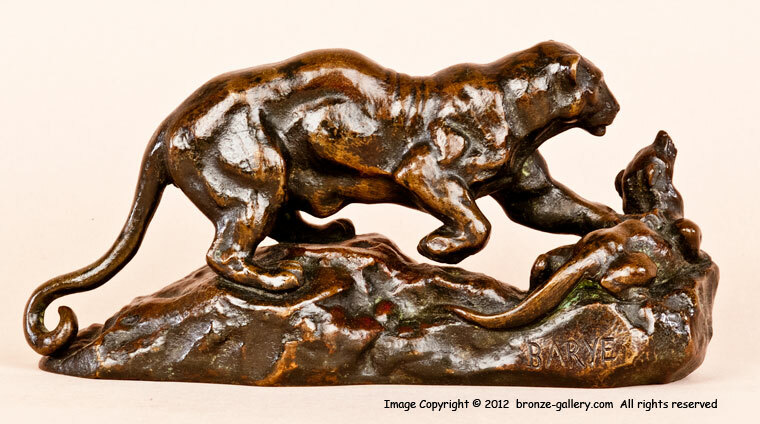 Barye's sculptures of big cats and their prey are among his best and most popular works. 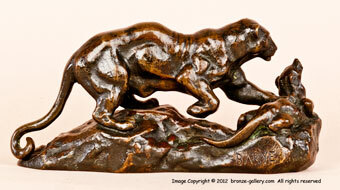 Here is a rare small bronze of a Panther Surprising a Civet Cat which was first modeled in the late 1850s. The Panther had pinned the Civet Cat down with his paw as the Civet twists back to try to defend itself. It is the timeless story of the smaller predator captured by the larger predator showing nature in the wild. 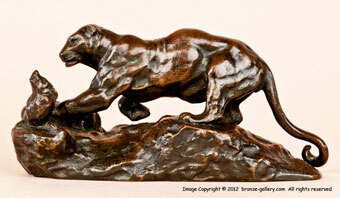 Like all of Barye's sculptures, the Panther is well muscled and powerful as he crushes the Civet Cat. A rare model that does not often come up for sale, this cast dates from about 1870. The bronze has a rich reddish brown patina. This model is illustrated in Payne's book Animals in Bronze on page 149.